Because of Mitch McConnell's obstructionism, Democrats recognize that it's necessary to reform rules to schedule votes on confirming NLRB members, a labor secretary and other Obama nominees. For the first time since the New Deal era, the United States could, by the time Labor Day 2013 rolls around, find itself entering into an extended period without either a secretary of labor or a functioning National Labor Relations Board. The prospects are dire for working people and for the unions that represent them. This is not a step that Reid wanted to take. But it the majority leader was left with little choice after McConnell, the Republican minority leader, made it clear that he and his allies would continue to employ an abusive definition of the filibuster to block President Obama's nominees in general — and to labor-related posts in particular. Obama has selected a well-qualified nominee for secretary of labor: Tom Perez, a former Maryland Department of Labor secretary who has served in the Obama administration as the assistant attorney general for the Civil Rights Division of the United States Department of Justice. But the Perez nomination has languished without Senate action since May, when it was approved on a 12-10 vote of the Senate Health, Education, Labor and Pensions Committee. The president has, as well, made necessary nominations to fill open positions on the five-member National Labor Relations Board. One of Obama’s nominees, Mark Gaston Pearce, is a current NLRB board member whose term expires in August. If the Senate does not confirm Pearce and the others, Communications Workers of America union president Larry Cohen argues that the board will be rendered ineffectual. But the Senate cannot act under its current rules, which allow a minority of senators to abuse the filibuster power in order to block votes not just on legislation but on presidential nominations. Senate minority leader McConnell, who has made no secret of his disdain for unions and the federal laws that have for seventy-eight years provided a measure of fairness for working people and the organizations that represent them, practices his most militant obstructionism when it comes to labor rights. It is hard to imagine that nominations for labor secretary or for the NLRB will get Senate votes if the existing filibuster rules are not changed—at least when it comes to the confirmation of nominees. So Reid will on Thursday gathered the Senate Democratic Caucus to again ponder the modest filibuster reforms that senators such as Udall and Jeff Merkley, D-Oregon, have been proposing for several years. The reform efforts of Merkley and Udall have been thwarted repeatedly, creating great frustration on the part of the Democratic base. But this time it appears to be different. 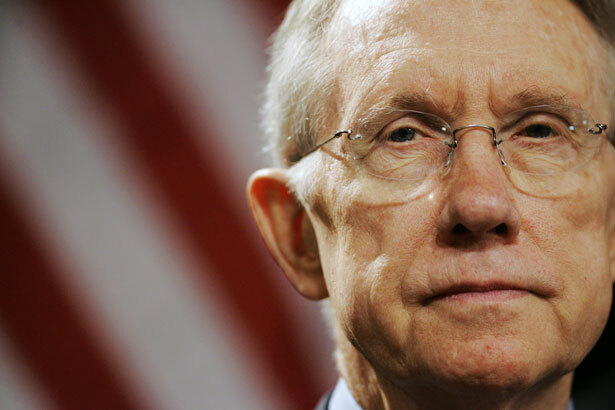 Reid confirmed that he was moving to "file cloture on a bunch of nominees." While the majority leader has not declared that he is invoking the "nuclear option" — which would restore majority rule when it comes to scheduling and carrying out votes on executive branch nominations — Senate sources told Politico on Thursday that Reid was taking steps that "could set the stage for a vote on the nuclear option as early as Tuesday." If McConnell and his allies do not allow votes on nominations, Reid will be positioned to ask the Democratic majority to enact a rules change that reforms the filibuster so that — while members could still conduct traditional "Mr. Smith Goes to Washington" speaking filibusters — they could no longer use secretive threats and backroom maneuvers to prevent votes. Savvy activists have come to understand that the debate is no longer merely about filibuster reform or arcane Senate rules. McConnell’s obstructionism now threatens to render the NLRB dysfunctional—and to make the enforcement of rules protecting American workers dramatically more difficult. This is about a lot more than politics. It is about whether the government will function as it has under Democratic and Republican presidents, under liberals like Franklin Delano Roosevelt and conservatives like Ronald Reagan. It is about whether the constitutionally defined responsibility of the Senate to provide advice and consent, to approve or disapprove presidential appointments, is respected. And it is about whether working Americans will have a government that watches out for them—as opposed to Mitch McConnell’s corporate campaign contributors. Christopher Hayes takes a quick tour through the filibuster's history and the options for its removal or amendment.